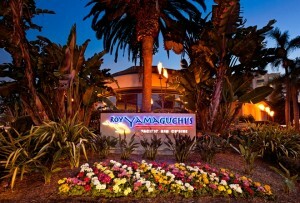 Maloney notes that “for 25 years, Roy’s has continued to raise the bar on culinary innovation while providing a memorable dining experience that offers an escape from the ordinary.” With this, I recently went on-site to sample and scrutinize what Roy Yamaguchi’s Pacific Rim Cuisine La Jolla has to offer. Upon entering the restaurant, I was immediately struck by the chic and spacious modern dining area and adjacent lounge. Most impressively, both offer full view of the exhibition-style kitchen where the skill of culinary masters can be readily observed. According to Maloney, each of Roy’s chef partners, including Chef Charles Andres at the La Jolla restaurant, have been trained under the guidance of Chef Roy Yamaguchi himself, making watching the kitchen brigade in action even more exciting. Once seated, the server delivered a complimentary bowl of steamed Edemame sprinkled with an addicting savory seasoning. I then settled in with a perfectly chilled unfiltered sake to digest the menu options that, to my liking, are heavily focused on seafood. To Maloney’s point, the restaurant’s regular menu is offered alongside seasonal dishes that are localized with regional produce and proteins. This as the restaurant strives to further develop food offerings that tap local culinary creativity and proffer distinctive experiences at each Roy’s location. 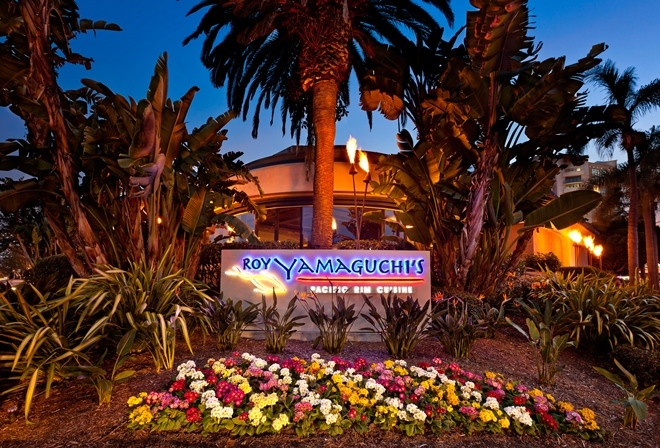 So, along with traditional Roy’s favorites, the La Jolla location and other Roy’s have local chef specialty dishes and supplementary seasonal menus. 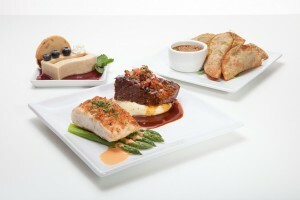 In addition, earlier this year all Roy’s locations (except Hawaii and Pebble Beach) had re-introduced a Fall Prix Fixe Menu allowing guests to feast on a specific three-course meal, including an appetizer, entrée and dessert, value priced at just $36.95. The Prix Fixe menu, which I had the opportunity to taste on the evening of my visit, achieved perfect balance with three delightful dishes. The Prix Fixe experience commenced with a Wagyu Beef Gyoza with sesame citrus shoyu appetizer. While my personal preference is for gyoza to be pan-fried or even steamed, this deep fried version was duly elevated by the rich and flavorful Wagyu beef utilized in lieu of minced pork that often populates this dumpling variety. The bright shoyu sauce, similar to a citrus-laden ponzu, was the perfect complement to cut through the oil from the frying process. 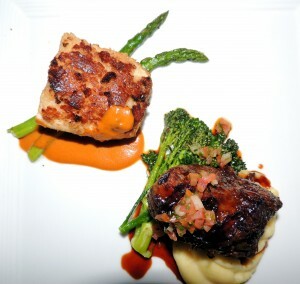 The Prix Fixe entrée was a “two-fer” surf and turf comprised of a generously portioned Macadamia Nut Crusted Mahi Mahi with lobster cream and a succulent Braised Beef Short Rib with natural braising sauces. The Mahi Mahi was delivered with a perfect sear that locked in the moisture, making the fish flaky and flavorful. The rich lobster cream accompaniment gave this mild fish a fabulous flavor that left me longing for more. The short rib counterpart was juicy, tender, well-seasoned and decidedly lean, and I was pleased it was served with natural juices that were a welcome reprieve from the rich cream sauce accompanying the fish. The Prix Fixe finishing touch was a decadent desert of Vanilla Cremeaux accompanied by white chocolate and lemon sable cookies and a blueberry sauce. While, to me, this dessert was more reminiscent of spring, the lightness of the dish was apt amid the heavier appetizer and entrée components and preparations. 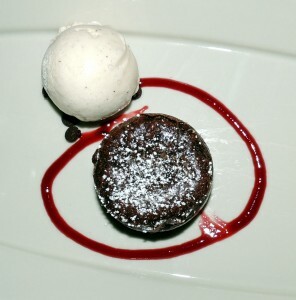 The vanilla, lemon and blueberry elements worked in unison on the palate, as did the juxtaposed texture of the crisped cookies with the velvety Cremeaux that was more comparable to a flan than a mousse. Prix Fixe menu aside, should you want a sneak peek into Roy’s best-selling dishes around the world simply opt for flagship menu items that have become international favorites, including the Golden Lobster Pot Stickers, Misoyaki Butterfish, and the insanely decadent Melting Hot Chocolate Soufflé—the latter two I have also sampled, savored and can personally recommend. The La Jolla location menu also boasts exciting new creations never before seen at any other Roy’s location, so be sure to ask your server for new additions when you visit. The Prix Fixe and other season-driven menu enhancements are just one indication of Roy’s enduring focus on offering an unmatched dining experience. According to Maloney, “Our commitment to each Roy’s location’s community goes beyond just good food. We offer unique experiences each month, including cooking classes, wine tastings and children’s events.” Indeed, Roy’s La Jolla location invites guests to join Chef Andres for “lunch & learn” monthly classes where he demonstrates how to create the quintessential Pacific Rim experience in your own home. 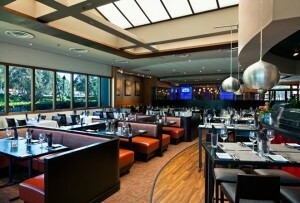 The La Jolla location also hosts a nightly “Aloha Hour” in the bar area from 4:30 to 6:00 p.m. where specialty cocktails, glasses of featured wines and newly introduced menu items are available for just $6. In my estimation, Roy Yamaguchi’s Pacific Rim Cuisine is one culinary excursion worth taking.